Pack up your family of eight and load up the dog for a fun camping trip you won't forget in this SolAire Ultra Lite travel trailer. The kids will love having their own space in the bunkhouse that includes two bunks, an entertainment center, and their own door to the outside. Invite the grandparents with sleeping space on the sofa sleeper in this unit. 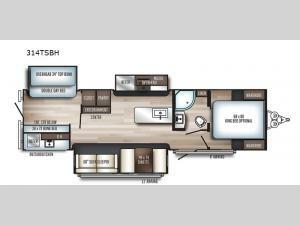 With a pantry, and a refrigerator in this travel trailer, mom will have plenty of space to store food for the week, plus overhead storage for kitchen knickknacks. This model features a front private bedroom with a queen bed, his and her's wardrobes, and a door to the dual entry bath. This travel trailer also includes an outside kitchen, and two awnings so you can spend more time outdoors surrounded by nature.